File this under “silly bugs-by-design recognized by Microsoft but can’t do anything about but ruin a great user-experience” (see footnote), and also, “very useful Windows Vista tips from Long Zheng”. The latter being most important. This guide will show you the best way to stretch and apply wallpapers in Windows Vista whilst maintaining the best quality possible. In Windows Vista, for some silly reason, the desktop control panel does not perform image interpolation correctly on JPEG images. Therefore, when you apply a wallpaper not exactly the same size as your screen resolution, the end result can be awful. But however, bitmap (BMP) images ARE properly interpolated from the control panel. Go figure that one. Quite simply, use the “Set as Desktop Background” function when you right-click images. 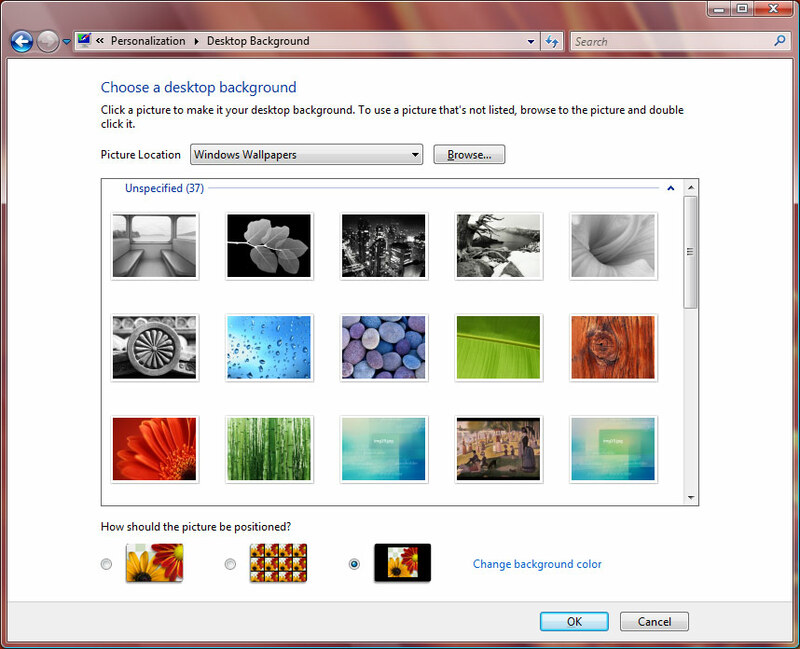 The “Set as Desktop Background” function utilizes the PIX engine, which powers the Windows Photo Gallery application. PIX supports image interpolation, and applies it correctly to images when you set as a wallpaper. As a side note: it’s unsure why the Windows Photo Gallery itself doesn’t use image interpolation on photos when zooming in pictures, but add that to the list of strange behaviors by-design at Microsoft. An insider tell me this is a recognized problem even by the Microsoft designers themselves, but unable to fix because of the legal and legacy issues surrounding it. But at least you now know, the right and best way to apply desktop backgrounds in Windows Vista. But don’t tell your friends, let them suffer. In addition: At least Vista maintains image aspect-ratio when rescaling to wallpapers, a concept XP never understood. So it’s not that much of a step backwards. Update: Microsoft reads. Microsoft listens. Microsoft fixes. All in a day’s work. Does the ‘desk.cpl’ from XP run under Vista? And does XP get it right? XP has a different wallpaper control panel implementation, and does perform interpolation. So for some silly reason, it is broken in Vista. “Legal and legacy issues”? They bought their imaging engine and didn’t pay full royalties? Apple has patented the interpolation invoked from control panel? Legal and legacy issues are their standard excuses for almost anything. Yeah, and usability testing on 5 and 120 year olds, too. pure guess, but i think that if you apply a .bmp as a wallpaper it converts it (including filtering/upscaling) to a .jpg which would be easier on the video memory. But if you rename and copy over “desk.cpl” from XP over to Vista and double click it (right click => Open with Control Panel), does it work? @some1: I just tested it, and it does nothing. And tried right click too. It doesn’t load anything, no errors, absolutely nothing. So, there’s no real reason it works like this? Will it be fixed by RTM? @Code.Red: Most likely it won’t be fixed by RTM. Pingback: The CTRAN weblog » Blog Archive » The definitive Vista Wallpaper guide….